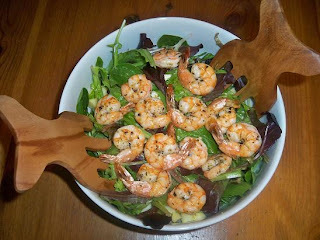 In an on-going effort to eat well and cook healthy, I made really good roasted shrimp on a bed of mixed greens and other fruits and veggies. I used my signature oil/mustard/lemon juice/honey vinaigrette and the overall effect was delicious. I don't think you need another side dish with this, but it can use some nicely toasted bread or pita. Hint - When buying fresh shrimp, get the uncleaned vs. the cleaned - it'll provide a significant savings. I couldn't believe that the cleaned shrimp was a whopping $16.99/lb vs. the uncleaned which was a mere $6.99/lb at Whole Foods. It takes an extra 15 minutes to clean and devein, but it's worth it. Peel and devein shrimp and then coat in olive oil (about 2 tbs). Season with salt and pepper and then mix thoroughly with your hands until well incorporated. Place on foil-lined baking sheet and put in oven for about 5 minutes or until the shrimp turns pink. In the meantime, prepare the salad by tossing the greens with the peppers, apples, cheese, cherries and then finally the dressing. When the shrimp is done, place on top of the greens and enjoy. As I mentioned, a crusty piece of bread or a pita might be tasty with this. Bon appetit. You can get a pound of beautiful cleaned shrimp on 30th ave for $8-$9. Thank you Gar. Anon - good tip, what place are you talking about? I'm not 100% on the name, but I think it's something like "Ocean Fish Market". It's on the south side of 30th Ave, between 35th and 36th. No, that's a block down, but not a bad choice either.